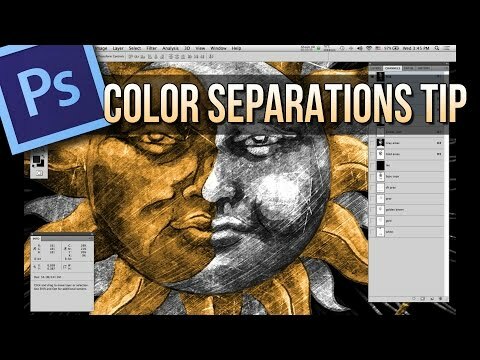 Using utility channels in Photoshop while creating color separations is something I do every single time I sep. We use utility channels to help us get more control over our separations. Doing this isn’t something you can do. It’s something that you should do. I do it on every separation I create and so should you. Keep in mind that this is a process and we build upon our channels, step by step. There’s no magic wand in Photoshop that’s going to give you exactly what you need. I played around with airbrushing for a bit when I was a kid. I was frustrated with the amount of time that was spent masking off areas, removing the masks, and re-masking over and over again. A really poorly airbrushed hockey helmet was the eventual result. (Sorry Jason!) But, I learned that much of the time spent airbrushing was spent making masks. Much of the time we spend on a file isn’t going to be on simply pulling color. We spend a portion of our time on creating ways to better pull color from an image. What are your utility channels? Have your own method of using channels to help separate images? Share them with us in the comments section! It’s always appreciated. Using utility channels in Photoshop can greatly help you gain control over your images, especially when creating color separations for screen printing. Hello, good morning, I would like to thank you, I’m from Brazil and I’m very grateful for your videos and tips, because I’m slowly learning from you on the other side of the brigade Julio Cesar.